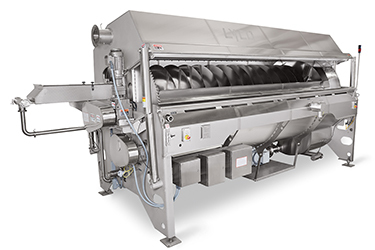 Clean-Flow® Blanchers / Cookers came to market in 2007 and they are called that because depending upon the product they run, they are cleaned-up in minutes compared to the many hours for competitive designs. This allows faster change-over. They are called “The best pasta, rice and vegetable cookers in the world!” because they contain patented water agitation that breaks up heavy dense loads of product and keeps them separated and suspended in motion so each particle of food is treated exactly the same way. Spaghetti to filled pastas are uniformly and thoroughly cooked. Sticking and clumping are totally eliminated which increases yield by as much 10-15% compared batch cook-quench-chill systems or older rotary drum blancher designs. They are used in our continuous (not batch) Cook / Quench / Chill system which is far superior to batch systems. Clean-Flow® Blanchers save labor, water, energy and reduce maintenance cost to nearly zero — after years of running. We make 30″, 40″, 50″ and 60″ diameter models. CONTACT US to run your products in our Laboratory and we’ll show you what perfect quality looks like!